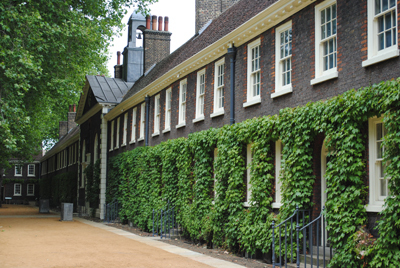 It’s a big year for the Geffrye Museum in Shoreditch – not only 300 years since the almshouses were first opened to house the poor and elderly, it’s 100 years since the almshouses were converted into the museum which now occupies the site. With that in mind, we thought we’d take a look at the almshouses themselves (we’ve looked at the museum – which features 11 period rooms from the 17th to 20th centuries – a couple of times previously). 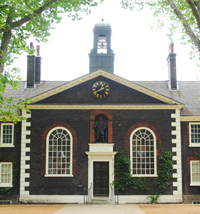 The Grade I-listed almshouses were built in 1714 by the Worshipful Company of Ironmongers, using funds that had been bequeathed to them by Sir Robert Geffrye, a Cornishman who became twice-master of the company and a Lord Mayor of London (there’s a fine statue of him adorning the front of the building). They comprised 14 houses, each of which had four rooms, and provided accommodation for up to 56 pensioners. Arranged in a U-shape around a courtyard, the two storey almshouses came complete with a chapel which still stands at the centre of the the complex and where residents were expected to attend each week (a walkway which runs around the back of the chapel was added in 1914 offers some great views of the garden). The almshouses, which had originally been built in what was a largely rural context, remained in use until the early 20th century by which time the area had become one of London’s most crowded with poor sanitation. In 1910, the Ironmongers’ decided to sell off the almshouses and move out to the safer, cleaner area of Mottingham in Kent. In 1912, the houses and gardens were purchased by the London County Council – attracted by the public open space – and following representations from members of the Arts and Crafts movement, the museum opened its doors in 1914. It’s still possible to visit a former almshouse – number 14 – which was restored and opened in 2002 and has been furnished to show what life was like there for the pensioners (contrast the sparse furnished there with that with some of the more opulent rooms on display in the museum – and don’t forget to allow some time to visit the gardens; there is also a shop and cafe on site).